Ohio State's Kyle Young, left, and Iowa's Ryan Kriener battle for a rebound during Saturday's game in Iowa City. Iowa forward Luka Garza, center, rips down a rebound during the first half against Ohio State Saturday in Iowa City. Iowa forward Tyler Cook is helped off the court after an injury during the second half of Saturday's game against Ohio State Saturday in Iowa City. Iowa won 72-62. Iowa guard Jordan Bohannon celebrates a 3-point basket against Ohio State Saturday. IOWA CITY — What a difference a year makes. For that matter, what a difference a week makes. Just seven days ago, the Iowa basketball team was 0-3 in the Big Ten and Hawkeye fans everywhere were wringing their hands. The defense still looked bad. It felt like a rerun of last season. 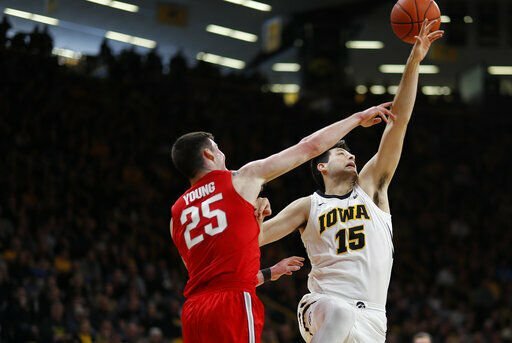 On Saturday, Iowa played perhaps its best defensive game of recent seasons, thoroughly frustrated one of the Big Ten’s best big men, dominated in the paint and rolled to a 72-62 victory over 16th-ranked Ohio State at Carver-Hawkeye Arena. The Hawkeyes are now 3-3 in the Big Ten after their second win of the week over a ranked team and their eighth win in the past nine games. At 14-3, they already have matched their victory total of a year ago. Tyler Cook and Luka Garza, both of whom have been plagued by lower-body injuries in recent weeks, returned to the starting lineup Saturday and led the way as the Hawkeyes dominated inside. Cook, who missed Wednesday’s victory over Northwestern because of a sore right knee, went down again with an apparent injury to his left ankle with 4 minutes, 7 seconds remaining although it may not have been as serious as it looked. Iowa coach Fran McCaffery would only say that Cook is “sore.’’ Garza said he didn’t think it looked as serious as the ankle sprain that sidelined him for three games. Bohannon didn’t seem concerned at all. Even the potential loss of their leading scorer couldn’t overshadow another victory that was accomplished largely at the defensive end of the court. Asked if this was the sort of game the Hawkeyes would have won last season, when the offense was good but the defense was non-existent, Bohannon never hesitated. The Hawkeyes pestered the Buckeyes incessantly for 40 minutes and really got after star center Kaleb Wesson. Ohio State, which shot better than 50 percent from the field against Iowa twice last season, made just 37.3 percent this time and also committed a season-high 21 turnovers. Wesson finished with only two points and turned the ball over five times. The 6-foot-9, 270-pound sophomore hadn’t scored fewer than eight points in a game all season and came in averaging 17. Garza said the Hawkeyes executed the game plan perfectly by coaxing Wesson into two fouls in the first three minutes of the game. Meanwhile, Iowa’s trio of big men combined to score 42 points. Garza led the way with 16, 14 coming in the second half. Cook added 15 and backup center Ryan Kriener 11. It all contributed to a 36-18 advantage in points in the paint. Despite that, Ohio State (12-4, 2-3 Big Ten) managed to claw out a 26-24 halftime lead. A 9-0 scoring run early in the second half that began with seven points by Garza and was capped by a Cook dunk gave the Hawkeyes a 37-30 lead and they were in control the rest of the way. Another run that included four straight free throws by Joe Wieskamp pushed the margin into double figures. Ohio State coach Chris Holtmann said Iowa’s defense was clearly much better than anything the Buckeyes saw in those two meetings a year ago. Garza said it probably was the Hawkeyes’ best defensive effort yet. McCaffery said this is exactly what he envisioned and expected when his team committed itself to stronger defense during the off-season. HITTING 1,000: Bohannon became the 48th player in Iowa history to score 1,000 career points when he dropped in two free throws with 1:19 remaining in Saturday’s game. He becomes the third member of his family to achieve the feat, joining brothers Jason, who did it at Wisconsin, and Matt, who did it at Northern Iowa. UP NEXT: Iowa’s next game will be on the road Wednesday at Penn State. Game time is 6 p.m. with television coverage provided by the Big Ten Network. OHIO ST. (12-4) — A.Wesson 4-7 3-4 13, Young 3-5 0-0 6, K.Wesson 1-5 0-0 2, Woods 1-5 0-0 2, Muhammad 2-9 2-2 7, Ahrens 2-3 0-0 6, LeDee 2-8 2-3 6, Washington 1-4 0-0 2, Jallow 3-6 0-0 8, Jackson 3-7 1-2 10. Totals 22-59 8-11 62. IOWA (14-3) — Cook 5-10 5-9 15, Garza 6-7 3-4 16, Wieskamp 3-7 4-4 10, Moss 3-7 2-2 9, Bohannon 1-7 3-4 6, N.Baer 2-8 0-0 4, Kriener 5-7 0-0 11, Dailey 0-1 0-0 0, McCaffery 0-1 1-2 1. Totals 25-55 18-25 72. Halftime — Ohio St. 26-24. 3-point goals — Ohio St. 10-25 (Jackson 3-4, Jallow 2-3, A.Wesson 2-3, Ahrens 2-3, Muhammad 1-5, Young 0-1, LeDee 0-1, Woods 0-1, Washington 0-2, K.Wesson 0-2), Iowa 4-16 (Kriener 1-1, Garza 1-2, Bohannon 1-3, Moss 1-4, Wieskamp 0-2, N.Baer 0-4). Fouled out — Jackson. Rebounds — Ohio St. 36 (K.Wesson 6), Iowa 34 (Cook 8). Assists — Ohio St. 14 (A.Wesson 4), Iowa 15 (Bohannon 8). Total fouls — Ohio St. 23, Iowa 15. A — 14,528 (15,500). OHIO ST. (12-4) -- A.Wesson 4-7 3-4 13, Young 3-5 0-0 6, K.Wesson 1-5 0-0 2, Woods 1-5 0-0 2, Muhammad 2-9 2-2 7, Ahrens 2-3 0-0 6, LeDee 2-8 2-3 6, Washington 1-4 0-0 2, Jallow 3-6 0-0 8, Jackson 3-7 1-2 10. Totals 22-59 8-11 62. IOWA (14-3) -- Cook 5-10 5-9 15, Garza 6-7 3-4 16, Wieskamp 3-7 4-4 10, Moss 3-7 2-2 9, Bohannon 1-7 3-4 6, N.Baer 2-8 0-0 4, Kriener 5-7 0-0 11, Dailey 0-1 0-0 0, McCaffery 0-1 1-2 1. Totals 25-55 18-25 72. Halftime -- Ohio St. 26-24. 3-point goals -- Ohio St. 10-25 (Jackson 3-4, Jallow 2-3, A.Wesson 2-3, Ahrens 2-3, Muhammad 1-5, Young 0-1, LeDee 0-1, Woods 0-1, Washington 0-2, K.Wesson 0-2), Iowa 4-16 (Kriener 1-1, Garza 1-2, Bohannon 1-3, Moss 1-4, Wieskamp 0-2, N.Baer 0-4). Fouled out -- Jackson. Rebounds -- Ohio St. 36 (K.Wesson 6), Iowa 34 (Cook 8). Assists -- Ohio St. 14 (A.Wesson 4), Iowa 15 (Bohannon 8). Total fouls -- Ohio St. 23, Iowa 15. A -- 14,528 (15,500).